Let me ask you a question: How do you feel when you find a grammar error or typo in a book you are reading? Are you sad for the author? Sad for the editor? Do you feel a bit smug that you found the error and obviously no one else did? What if it were your own writing and someone else caught the error? How would you feel then? 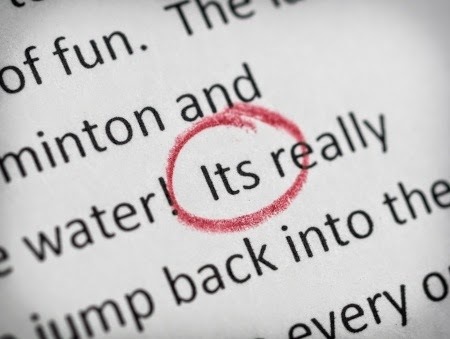 I'm going to give you some proofreading tips to help reduce the amount of errors or typos found in your writing. Just follow these tips and hopefully one of your readers won't come across an error and feel a bit superior that they found an error you didn't. Remember this, Mark Twain said, "The difference between the almost-right word & the right word is really a large matter--it's the difference between the lightning-bug & the lightning." 1. The first thing you can do is let your writing rest. For how long? For however long it takes to really get away from it and not have it in your head when you go back to re-read it. According to Hemingway, he wrote the ending to Farewell to Arms 39 times before he was satisfied. 2. Expect to do some rewriting. Leo Tolstoy wrote, "I can't understand how anyone can write without rewriting everything over and over again." Rewriting is the best way to learn to write. 3. Proofread in hard copy only. Reading on a computer is too easy to get lost in the writing and not see the errors. 4. Are you sentences properly constructed and clear? 5. Have you checked all questionable spellings? 6. Is your punctuation correct? 7. Have you used proper transitional expressions to tie your paragraphs together? Your chapters together? Does the continuity of the story flow throughout? 8. Does each scene have one clear and concise point of view? 9. Does your dialogue work with the story theme and move the story along or is it stagnant and conversational? 10. Have you read your story aloud? Have you had someone else read your story aloud to you? 11. Silently read your story backwards. This will help you catch many errors that are "hidden" in the story. You will not be caught up in the story and can focus on the words. 12. Proofread for one kind of error at a time. You will have to read your writing several times, but it's worth it if you can concentrate on only finding one kind of error at a time. 13. Always make sure you have double-checked your facts, figures, and names. There are many times I've read a book where the main character is named something like "Carl" in the first 5 chapters, and later changes to "Charles" in the remaining chapters. It can be very confusing to the reader. 14. Don't always rely on your spellchecker, but use your dictionary as well. 15. Always double check our apostrophes and contractions. Make sure they are constructed properly and fused appropriately. I'm sure there are more tips out there for proofreading but these tips have done me well when it comes to my own writing. My publisher was always happy to receive one of my manuscripts because they knew they didn't have to put in a lot of time editing it. My manuscripts were one of the cleanest they'd ever seen.